Manaslu Expedition for autumn 2016 has been scheduled by Satori Adventures Pvt. Ltd. for international group joining opportunity. Mount Manaslu climbing for autumn 2016 starts by the first week of September. 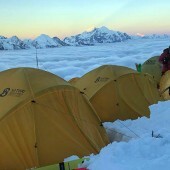 The autumn fixed departure allows individual or group climbers to share permit, base camp service or full board services. Some climbers already joined for the trip. Manaslu can be climb in autumn and spring season in Nepal. However climbing in autumn is more comfortable and has high success rate due to the various factors. Autumn is the best climbing time for Mount Manaslu. After the rainy and summer season, the temperature starts decreasing. Snow in the mountain area starts depositing. The weather is warm and not too cold. The high mountain rocky peaks start getting thicker snows. Due to the starting of snow deposit rope fixing is easier. The temperate of Mt. Manaslu in the day time will be found mild for climbing. As per our experience climbing in autumn is easier and the success rate of summit is high in the autumn. The routes are lush green, walking areas are flourish with many natural flowers. Due to the gradually decreasing of temperate, the snow depositing in the mountain just starts. In the begging the routes are clearly visible and no kharpases are filling lightly with snow. Fixing the climbing ropes, ladders and camps are more easily in autumn. 31 Aug/Day 01: Arrival in Kathmandu Airport and transfer to hotel Yak and Yeti or similar hotel accommodation in Kathmandu (1350M/4430ft). 01 Sep/Day 02: Preparation, briefings, last minute shopping and permit formalities. 08 Sep/Day 09: Trek from Namrung to Lho (3150m/10334ft) 5hrs. Tea house/camping. 12-30Sep/Day 13-31: Climbing period. (8163m/26781ft.) Camping. 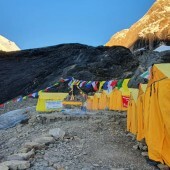 02 Oct/Day 02: Trek from Base Camp to Sama Gaun (3780m/12401ft) 3hrs. Tea house. 03 Oct/Day 03: Trek from Sama Gaun to Namrung(2550m/8366ft) 6hrs. Tea house/camping. 04 Oct/Day 04: Trek from Namrung to Philim village (2300m/7546ft-06hrs) Tea house/camping. 06 Oct/Day 06: Trek from Machakhola to Arughat (950m3117ft) 8hrs. Tea house/camping. 07 Oct/Day 07: Drive from Arughat to Kathmandu (1350/4429ft) 7 hrs. Transportation provided by tourist mini bus.Hotel accommodation in Kathmandu. 08 Oct/Day 08: Free day.Relax and shop in Kathmandu. Farewell celebration dinner with cultural program in the evening. 09 Oct/Day 09: Transfer to KTM airport for final departure.